Montana Rancher teams up with Russian businessmen to set up the Stevenson-Sputnik Ranch, a new agro-business, in southern Russia. Half a dozen cowboys sit around a long table in a newly built bunkhouse, waiting for lunch. They spent the morning in the usual routine — the herd of 1,500 cattle is calving and it has been a busy month — but when the food arrives it is a stark reminder they are not at home in Montana. Lunch is soup followed by spaghetti and a meat patty. On the table in front of these men, the plates look small. The cowboys have all lost weight, but they didn’t sign up for a vacation. The weather may be the same as in Montana, but the land — about a two-hour drive south of the city of Voronezh — is very different. Now the quality of the cows matches the quality of the land. Stevenson says his partners’ ambitions included importing “one of the top sets of Angus cattle in the world,” with full pedigrees going back several generations. The imported cattle cost roughly $7 million, and total investment in the ranch has been about $19 million, with around $15 million coming from a state-subsidized loan from Sberbank, Russia’s national savings bank. Russia consistently imports 40,000-50,000 live cattle per year, according to U.S. statistics. The government wants to bring that figure down, and a Food Security Doctrine signed by President Dmitry Medvedev a year ago demands Russia produce 85 percent of its meat domestically by 2020. Sergei Goncharov, one of the Russian partners in the joint venture, said cutting imports is so important to the government that subsidies cover one out of every four dollars the partners put into the project. The partners believe the prices the cattle will command mean the project will make money quickly. Goncharov’s company, Sputnik, which is based in the Leningrad Region around St. Petersburg, is already involved in cattle embryo transfer and in vitro fertilization. The company, it turned out, needed some management expertise as well. Some of the basics were missing, Stevenson said. “They wanted the best of technology and resources, but what I felt that they needed was management, maybe more so than the live cattle itself,” he said. “The short-term goal at this point in time is for full American support for two years through every season of the year, with the anticipation that we can hand this off on a daily or yearly routine in that amount of time over to the Russians and this place can be functional,” Stevenson added. There are three fully qualified veterinarians on the ranch, but some of the farmhands have never worked with cattle before. 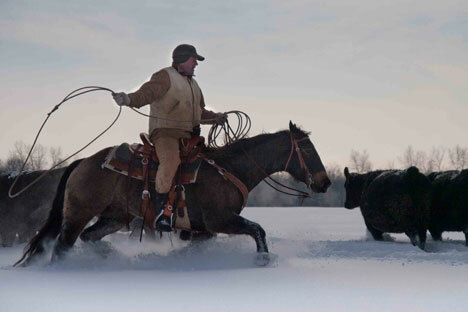 But they aren’t letting that hold them back — after just a month on the job, a Russian named Leonid is calling himself a cowboy. “It’s the first time I’ve done this work,” he said. “I’ve only done it for a month, but it’s not bad work; it’s a good team. The head vet, Alexander Naritsyn, admits that taking care of 1,500 cattle on the half-finished ranch would have been impossible without the imported help. After all, at the start of December there was almost nothing there. Now, more than 900 calves have been born on the ranch. Stevenson recalled that the handlers at Sheremetyevo Airport could have done with that kind of expertise when one shipment of cattle was flown in from Chicago. One cow got free when they were being transferred from the 747 to the truck for the drive to the ranch. The airport was closed to planes for almost an hour until the runaway was corralled into a truck. Some of the locals on the Stevenson-Sputnik Ranch may have started with little more knowledge of cattle farming than the Sheremetyevo cargo handlers, but Stevenson said they are keen to learn. Teaching their Russian colleagues how to take care of the cattle is the hardest part of the job for the cowboys. Conn, from Avon, Mont., said not all of the farmhands will have what it takes.